Jim is working as an innkeeper, together with his friend, the mouse Gran. One day, a mysterious man visits the inn, leaving a map behind. The map shows an island with a treasure. So the duo sets off in their own little boat, trying to fulfil their dreams and leaving the inn far behind. But it seems more people knows of the map, as they cross paths with Captain Silver and his band of wild pirates. Jim, Gran and their new friend Kathy tries to beat them in the treasure hunt that ensues. Based on the popular classic young boys novel by Robert Stevenson, only with animals added! All of the characters (save two) are anthropomorphized, although it really doesn't mean anything with respect to the story itself (as in, the animal characteristics do not really play a role in how the characters act). It's really just to make the story a little more palatable to a wider (and a bit younger) audience. The story is pretty straight-forward. Young Jim Hawkins gets his hands on a treasure map, and heads out to sea in search of his fortune. He ends up on a pirate ship, where the captain tries to take the map and find the treasure himself. Along the way they run across Kathy, the granddaughter of the map's original creator. And the keep fighting as they make their way towards Treasure Island. Lots of swashbuckling fight scenes, but since this is aimed at a younger (pre-teen) audience there's no blood and many of the scenes are over-exaggerated for cartoony effect. Furthermore, the action/adventure fight scenes are then interspersed with more slapstick humor -- in fact, there's a bit too much of the slapstick overbalancing the action. The animation is very crisp and clean and well done, as Toei was really starting to come into its own at this time. They were still very much heavily under the shadow of Disney (as the storytelling and character designs reveal), but the more non-Disney anime elements were just starting to work their way in. Partly due to the influence of Hayao Miyazaki as key animator, it is very easy to spot his influences throughout. Not only in some of the character designs, but in some of the very well choreographed action scenes. Animal Treasure Island is a worthwhile watch, as long as you keep in mind that it's generally aimed at the 8-10 year old viewer. Also, as an English dub, it can be enjoyed by the young non-anime fan as well -- it still holds up almost half a century after it was created, worthy to be held up in comparison with any Disney movie of the era. 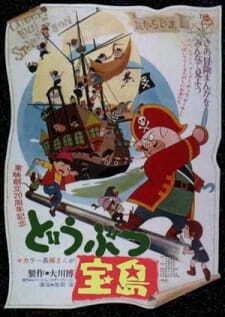 In 1958 Toei Animation came out with their first feature length film, Hakujaden. This film was such a big success that throughout the 60s and 70s they kept making a film like it every year. Generally these films tended to be high in production quality and in particular 1968’s Horus, Prince of the Sun wouldn’t be outshone as a sakuga showcase untill well into the 80s. Horus was a commercial failure, however, and Toei decided to change their business model and started making two films a year: one expensive and the other cheap. This change, together with the fact that a lot of talent working at Toei left around this time, led to the slow decline in quality of these films. Now, I'm telling all of this because I want to paint a picture of the anime industry in the 60s and 70s when Toei animation was still the big powerhouse of the industry. Anime hadn’t really become its own thing yet and when it wasn’t copying what foreign animation studio’s like Disney were doing, which is exactly what these Toei films generally try to do, then it could often be plainly amateurish. A lot of tv anime were cheap panel for panel recreations of the manga and besides summary movies that just used footage from the tv show, these yearly Toei films were basically all there was. Sometimes, however, something interesting popped up, that is worth remembering. I certainly don’t wish to push forth the idea that 60s and 70s anime isn’t worth your time, or that there weren’t tons of interesting creative figures in the anime industry who wanted to do cool stuff. What I do want to say is that anime around this time was on a leach. The people at Toei animation, in particular Isao Takahata and Hayao Miyazaki felt strangled by this leach. Isao Takahata’s ‘Horus, Prince of the Sun’ was his attempt to get rid of that leach but it failed and just a few years later he and Miyazaki left for greener pastures. Just before Miyazaki left Toei completely, however, he created the manga, as well as the concept and a lot of the most impressive animation of the film Doubutsu Takarajima. This film is different from all the other Toei films, in that it is for a large part a passion project like Horus, but it is also extremely well suited for a large casual audience, like the dryer and more commercial Puss and Boots(1969) or most of the other Toei films. This is generally how Miyazaki’s entire career can be described. The start of the film introduces you to Jim and his friend who is a mouse with glasses (I wonder if Ganba no Bouken was influenced by this film) and a baby. Where Jim’s parents are I don’t know, but if something like that had bothered me I wouldn’t be recommending this film. A mysterious man enters the inn, that Jim is working at and not long after a bunch of pig guys storm the place and try to go after him, whilst Jim climbs onto the roof with the map that the mysterious man left him. These first moments of the film are immediately pretty striking. The first shot in the film is of the town they’re in and the background art for this is really stylish and beautiful. The scene in the inn, though it takes a minute to get going, gets pretty exciting and fun, whilst also creating a decent amount of suspense. Generally the entire anime consists of lots of fun action moments like that, mostly taking place on the pirate ship and it culminates in this awesome 20 minute climax. On his journey to get to treasure island Jim gets captured by pirates, meets a girl named Kathy and together with her fights these pirates, whilst also using them and their ship to get to treasure island. A lot of the film takes place on the ship and a lot of fun things happen when the pirates and Jim interact. The pirates try tons of things to try and get the map away from Jim and Kathy and Jim and his mouse friend pay them back with tons of hijinx of their own. The last 25 minutes or so of the film take place on treasure island and is almost completely full of action. It’s an epic back and forth between the captain and Jim and Kathy with tons of awesome animation by Hayao Miyazaki. The art in the film is pretty striking. Lots of the backgrounds look great, with the only exception being the backgrounds in the jungle on treasure island, that just don’t do it for me. The character designs are simple but decently memorable. Because of their simplicity they can be animated in lots of ways and you’ll constantly be seeing them doing fun and wacky stuff. There’s also lots of visual comedy, which is often done in the middle of action scenes and lives on the general fast pace of all the action in this film. There’s also some great animation in this film, with lots of great shots of fearsome waves, a few really cool action bits with tons of stuff happening on screen at once and of course lots of great action bits during the climax with great rock slides and destruction. If I haven’t conveyed it enough during my review I’ll just spell it out for you: this film is super fun and silly. There are parts where the film gets a little slow, but for the most part it’s constantly throwing fast action bits and silly comedy scenes your way and these always have a tendency of getting a little unrealistic. I think the best example of this is the sword fighting, which is never very well choreographed, but is lovably silly. The characters are basically just waving their swords around. There is even a moment in the film where Jim is fighting off several pig pirates and he has to hurry up to go and help Kathy, and so he decides to just start swinging his sword even faster. It didn’t work. The music is pretty fun and there are a few tracks that really added to the scene they were in. There are a few songs, but luckily, unlike the singing in Puss and Boots, they didn’t get in the way of the film, even if they didn’t add anything to the narrative. Ultimately I think this film is a good watch for everyone who likes films that are just fun and not much else. It’s not always that: the first half is a bit slower than the second, but for the most part it’s a fun ride with lots of great action, animation and visual comedy and I’d recommend it to anyone who’s into that. Otherwise I can point you to the anime ‘Horus, prince of the Sun’, the other classic must watch Toei animation film, directed by Isao Takahata. this movie was such a fun ride.